I have a very easy but very cute project to share with you today. It's a photo frame I made for Practical Scrappers' altered projects feature. I got this very cheap frame in a crafts shop, and painted it with cream acrylic, then gave it touches of pink bubblegum glimmer mist, and removed some of the excess mist with a piece of cloth. 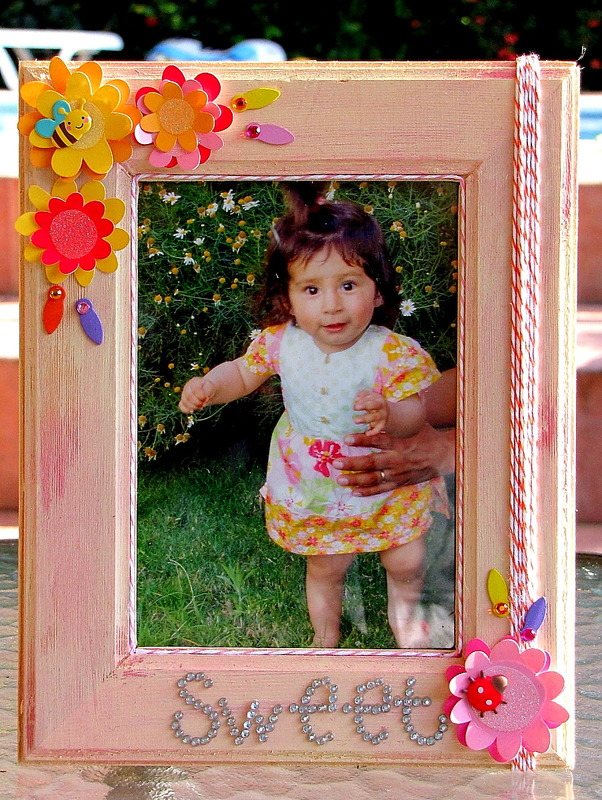 I then used stickers, brads, rhinestones, photo corners, and twine to decorate the frame. It took me less than half an hour to make and I love the result! I think I need to scrap lift this! it is amazing! This is adorable....I especially love the twine! Looks pretty easy to do, huh? I might have to give this one a try! Thanks for the inspiration!